Joe Byers, FVCC Brewing Program Director. Image Courtesy of: Flathead Community College. The majority of commercial craft brewers have started out as homebrewers and they have received their commercial brewing skills on the job. Though this system has obviously worked, there are advantages to going to school where hands on training in the commercial brewing field is offered. 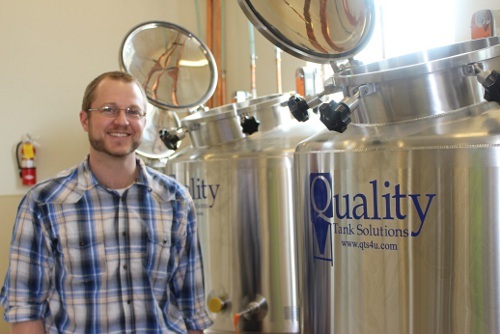 The Flathead Community College (FVCC) in Kalispell Montana offers such schooling and I was granted the opportunity to interview, Joe Byers, Program Director of Brewing Science and Brewing Operation to learn more about their program. Almost every homebrewer has dreamed of starting a brewery or at least of brewing at one where he or she can serve his or her beer, but the jump from homebrewing to commercial brewing can be steep. In the FVCC’s brewing program you will learn the pros and cons of doing things certain ways in the brewing industry without the loss of revenue resulting from making big mistakes in the real world. Formal education in what it takes to be a brewer or a brewery worker in general also increases your potential when compared to an individual with only homebrewing experience. Though the homebrewer can learn on the job from other people in the industry and by making mistakes, having already obtained that knowledge in a school setting allows him or her to focus on his or her work and get more done. In addition, the homebrewer turned commercial brewer, without formal training, usually learns everything at a rushed pace and thus nuances and the purpose behind doing or not doing certain things are typically lost. FVCC is one of only a handful of colleges offering a degree, or even training for that matter, in the beer brewing industry and they are the first to offer such a program in Montana. As I was writing this article I received a tweet from Charlie Papazian, whose feed I follow, about brewing schools and organizations. Flathead Community College is one of the twenty nine listed University Affiliated Brewing Programs in the Unites States, found here: https://www.brewersassociation.org/resources/schools-organizations. I should point out as it was pointed out to me when I requested to use the aforementioned link, that the Brewers Association does not endorse any of the organizations on the linked page. The list is simply to help potential students evaluate the different curriculums. You might be asking yourself: Why did FVCC create a brewing program? Simply put, Flathead Valley Community College regularly talks to local employers in the valley to discover what a quality work force for that industry looks like. FVCC then designs programs and courses that will cultivate potential employees with the skill sets needed by the employers they spoke with earlier. As it turns out, breweries are an important and growing employer in Montana and thus a good industry for FVCC to offer courses. The breweries that are in dialogue with FVCC have expressed a desire for a formal program to train brewery workers to help ensure that employees keep working for the local breweries. As is, many breweries face a high turnover as the employees learn brewing skills and then move on to breweries out of the area. Having formal classes in the Flathead Valley encourages potential employees that want to live in the Flathead Valley to be trained in the commercial brewing field while also being able to live in the valley and potentially work at local breweries. The cost of the whole program without scholarships or grants ranges from $11,074 to $25,354 depending upon your residency, i.e. whether you live in the Flathead or Lincoln County, in state, or out of state. This includes an estimated $1,800 in lab fees, but do consider that you might be eligible for scholarships such as those available for brewing science students through the Kalispell Area Chamber of Commerce. For more information on scholarships please contact FVCC’s Financial Aid Office at (406) 756-3632 or to visit https://www.fvcc.edu/scholarships. If you are worried about higher math, don’t, pre-algebra is about all you need and the applied math in chemistry is what is important. Yes, the required chemistry course does require a passing score on the chemistry placement test if you have not completed and passed a chemistry course within the past two years, but if you do not make the score on the test you have eighteen weeks to take and pass an online class to get you up to standard. As with most college programs the first semester is the most boring, but to make it more interesting Joe has added some hands on labs such as keg cleaning and OSHA awareness which follows what most new brewery employees start out doing and learning. In the second semester the students spend full days in the lab starting out on a small pilot system and then moving on to a production system. The intent is to spend half the time in the lab and the other in lecture. When the wort or beer dictates, however; the students will work in the lab to transfer, filter or perform similar tasks instead of sitting in lecture. From my perspective the Flathead Valley Community College has a nice brewing facility that would make any small brewery proud. They have a 3 ½ barrel 2 vessel system that allows them to make 100 gallons of beer per batch or 7 standard kegs depending upon how you want to measure it. They even have a grain mill in a separate room that feeds the crushed grain through PVC pipe into the mash tun. The downside to their brewery however, due to laws and regulations, is that they currently only keep at most 2 kegs of beer from each batch and the rest goes down the drain. Worse than that, the remainder of the 2 kegs after they have been aged and sampled, also goes down the drain. I asked Joe: In a perfect world what would you like to happen to the beer your students make? He said mainly for it to be legally sold, consumed and then to use the proceeds to offset the lab costs. He also mentioned that having the ability for students to be able to attend brew fests with their beer and talk with people in the commercial brewing field would be a huge addition to their school learning. Both selling and representing the beer that they brew would force the students to take ownership of their beer which is how it works in the real world of craft beer brewing. It should be noted that Montana lawmakers and the governor did pass a law allowing FVCC to apply for an academic brewer license that would allow them to sell beer made by their students to a distributor, but the Flathead Community College is still looking at all of the regulations and legalities involved both on the state and federal level before they apply. 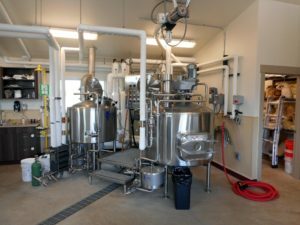 At the time of this writing, two students have graduated the FVCC Brewing Science & Brewery Operations program and two more have just a few classes to finish. All of them are either employed at local breweries and/or are being pursued by breweries out of the area. According to Joe the feedback from the local breweries has been positive, but he awaits the feedback from the graduated students to really help dial in the course structure. Presently, there is little college curriculum from other schools to use as a guideline and no real text book available. Most of the program structure is based on employer needs and also on Joe’s experience beginning as a keg and draught line washer and then later as assistant brewer and finally as head brewer at Tamarack Brewing Company in Lakeside Montana. I asked Joe what got him involved with commercial brewing and ultimately the brewing program at FVCC and he told me that it started with him and a buddy getting into making homebrew shortly after he graduated with a BS in Bio Chemistry from Eastern Washington University. He then got the opportunity to work for Tamarack Brewing Company where he learned everything through OJT, reading on his own and from talking shop with other brewers and people within the commercial brewing industry such as at brew fests. Even after getting to the point in life where he was brewing award winning beer, Joe had a longing to go back to school and when FVCC built their on-campus brewery he jumped at the opportunity. Currently the Brewing program at FVCC is a 2 year commitment and you must be 21 years old or older to apply for the program. The college is looking however, at an accelerated certificate program or just offering certain classes without a 2 year commitment. They might even offer some homebrewing classes, but that would be later down the road after they figure out the legalities of such courses, assuming it could even be feasible.